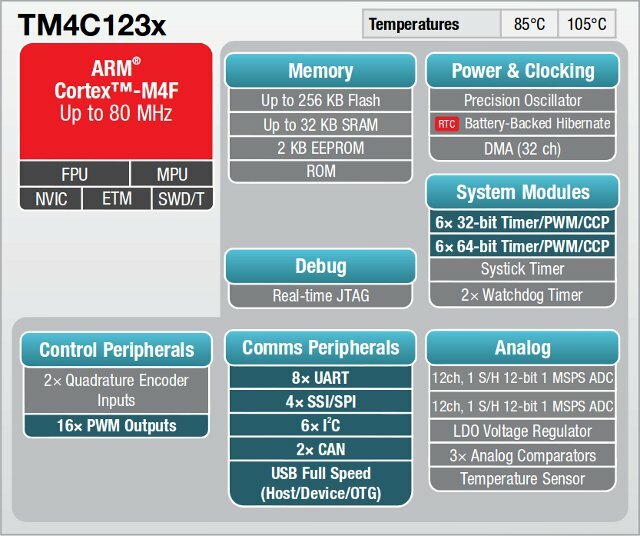 Texas Instruments has just announced the Tiva ARM MCU platform, and specifically the Tiva C Series TM4C123x ARM Cortex-M4 MCUs, which are the first Cortex-M MCUs to be built on 65 nanometer flash process technology. The Tiva C Series TM4C123x MCUs, formerly known as Stellaris LM4F MCUs, are available now and target home, building and industrial automation. MCU Core – ARM Cortex-M4 floating-point core, operating at up to 80 MHz. Mixed-signal applications with high-performance analog integration – 2×12-bit ADC and 3 comparators.12-bit ADC accuracy is achievable at the full 1 MSPS rating without any hardware averaging. On-chip connectivity options – USB (host, device and On-The-Go), UARTs, I2C, SSI/SPI, CAN, etc..
Non-volatile storage of user interface or configuration parameters to reduce system cost – Thanks to integrated EEPROM. Low power – Standby currents as low as 1.6 uA. Large choice of MCU RAM and storage sizes – Up to 256KB flash and 32KB SRAM. On the software side, TI-RTOS, a real-time operating system, is available to all TI MCUS, and for applications that do not need an operating system, TivaWare for C Series MCUs is a free toolkit allowing “no OS” software development. Support is available through FAE or via E2E online community. As with its other MCUs, Texas Instruments also provides a low cost evaluation kit. The board is compatible with TI’s BoosterPacks should you need to extend the capabilities of the board. The Tiva C Series TM4C123x MCUs are available now and price starts at 2.15 USD in 10K quantities. 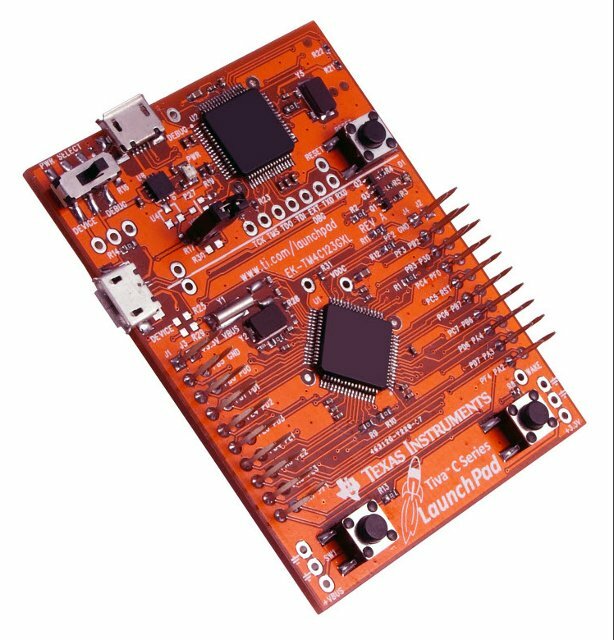 The LaunchPad kit (EK-TM4C123GXL) can be purchased on TI e-Store for $12.99 now, but you’ll need to wait 8 to 10 weeks before delivery. TI also announced Tiva C Series devices with Ethernet capabilities will be available in in the near future. Further information can be found in Tiva C Series page. Apart from the 65 nanometer flash, I see no differences. Deleted previous comment, as something wrong will TI Stellaris MCU link. Sorry. Basically it looks like there may be one extra CAN port (TBC). Also in Stellaris Launchpad: DO NOT USE EEPROM! Yes.. they are in the process of phasing out the LM3S Stellaris Micro-Controllers. There is a discussion on the Tiva series Launchpad at the Stellarisiti forums if you are interested. Make sure you buy the right one Launchpad. I feel a bit disappointed with TI. They released Stellaris and were selling it for like half year as “normal” product. However Stellaris was just buggy “alpha” version of what is coming now. “DO NOT USE EEPROM” – ridiculous!! I am using the Stellaris in a current product because it had all the right features at the right price. On eof the features was the built-in Ethernet controller. To this date TI did not release a TIVA with Ethernet! The Hercules line is the only one with built-in Ethernet so far. But those controllers start at $15 !! !